What functions do the different parts of the brain control? What is brain tumor? What is a spinal cord tumor? How are brain and spinal cord tumors diagnosed? What are the treatment options for brain and spinal cord tumors in adults? Where can a patient get more information about adult brain tumors? The brain is a soft mass of tissue that has three major parts, the cerebrum, cerebellum and the brain stem, all of which are effectively surrounded and protected by the bones of the skull; the brain is the tissue that controls people's voluntary and involuntary actions (that is, bodily functions, thoughts, and sensations). Cancer is the unregulated growth of abnormal cells in the body (cancer cells are also termed malignant cells). Malignant brain tumors contain cancer cells; benign brain tumors do not contain cancer cells but do contain abnormally growing and dividing cells that do not metastasize (spread to other organs) but may still cause problems, often because of their size and are regulated to grow in a specific area. Primary brain tumors are composed of abnormal types of brain cells with unregulated growth; the most common type is termed gliomas that arise from brain glial cells, but there are many other types (for example, astrocytomas, ependymomas, medulloblastomas and oligodendrogliomas). Secondary brain tumors are metastatic tumors comprised of cells from other organs where cancers have started and then spread through the bloodstream to the brain tissue. Symptoms of adult brain tumors, many of which are non-specific and occur in other diseases, may include headaches, nausea, vomiting, speech, hearing or vision changes, memory problems, personality changes and paresthesias (an abnormal sensation of the skin such as numbness, tingling, prickling, burning, or creeping on the skin that has no objective cause), and seizures. 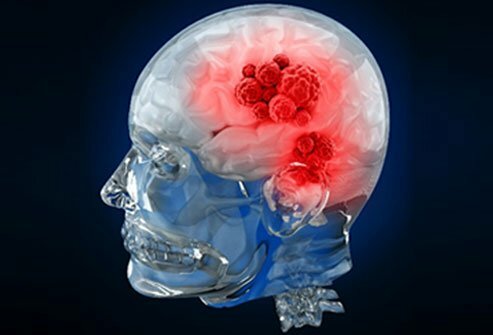 Brain tumors are diagnosed preliminarily by many methods including detailed physical exam, CT and/or MRI exams, angiograms, and X-rays; definitive diagnosis is by removing tissue from the tumor (tumor biopsy) and examining the cells microscopically. The grade of tumor is based on how abnormal the cancer cells look microscopically and how fast the cells grow and spread. Grade are from I to IV, with grade IV the most aggressive cancer. Recurrent adult brain tumor is a tumor that has recurred or come back after treatment. Metastatic or secondary brain tumors that commonly spread to the brain are lung, breast, unknown primary site, melanoma, and colon cancers. You and your medical treatment team (oncologists, neurosurgeons, second opinions, etc.) will discuss your treatment options based upon the type and grade of the tumor, your age, and any existing health problems. Treatment options may include chemotherapy, radiation therapy, surgery, or a combination of these therapies. However, in some case no medical treatment is necessary. Clinical trials offer other types and/or new methods that may help some patients. Treatment choices for a brain tumor depends on joint decisions made by the patient and the patient's physician team (team members may include oncologists, neurosurgeons, and others the patient may choose, including other doctors who may give a second opinion); treatment methods are based on the individual's disease and may consist of surgery, chemotherapy, radiation therapy, combinations of these methods or no treatment. Side effects of treatments are common and numerous, but vary from patient to patient depending on the disease, method(s) used and the effectiveness of medications and other methods to reduce them; some of the most common side effects are weakness, nausea, edema, skin changes and hair loss but may include more serious problems such as infections, seizures, disabilities such as speech problems, mental changes and occasionally, death. Rehabilitation is frequently included in the treatment plan; specialists like physical, occupational and speech therapists can help the patient improve. Follow-up appointments are part of the treatment plan for brain tumors to catch any recurrent disease and to help with rehabilitation treatments. Support groups are available to patients with brain tumors and to patients who have and are undergoing treatments, for example, the American Cancer Society, American Brain Tumor Society. Brain and spinal cord tumors can occur in both adults and children. However, treatment for children may be different than treatment for adults. Brain stem glioma (usually high grade): A brain stem glioma forms in the brain stem, which is the part of the brain connected to the spinal cord. It is often a high-grade tumor, which spreads widely through the brain stem and is hard to cure. Brain stem gliomas are rare in adults. Five types of standard treatment are used to treat adult brain and spinal cord tumors. Active surveillance is closely watching a patient’s condition but not giving any treatment unless there are changes in test results that show the condition is getting worse. Active surveillance may be used to avoid or delay the need for treatments such as radiation therapy or surgery, which can cause side effects or other problems. During active surveillance, certain exams and tests are done on a regular schedule. Active surveillance may be used for very slow-growing tumors that do not cause symptoms. This summary section refers to new treatments being studied in clinical trials, but it may not mention every new treatment being studied. For more information, U.S. residents may call the National Cancer Institute's (NCI's) Cancer Information Service toll-free at 1-800-4-CANCER (1-800-422-6237) Monday through Friday from 9:00 a.m. to 4:30 p.m. Deaf and hard-of-hearing callers with TTY equipment may call 1-800-332-8615. The call is free and a trained Cancer Information Specialist is available to answer your questions. The NCI Web site provides online access to information on cancer, clinical trials, and other Web sites and organizations that offer support and resources for cancer patients and their families. There are also many other places where people can get materials and information about cancer treatment and services. Local hospitals may have information on local and regional agencies that offer information about finances, getting to and from treatment, receiving care at home, and dealing with problems associated with cancer treatment. The NCI has booklets and other materials for patients, health professionals, and the public. These publications discuss types of cancer, methods of cancer treatment, coping with cancer, and clinical trials. Some publications provide information on tests for cancer, cancer causes and prevention, cancer statistics, and NCI research activities. NCI materials on these and other topics may be ordered online or printed directly from the NCI Publications Locator. These materials can also be ordered by telephone from the Cancer Information Service toll-free at 1-800-4-CANCER (1-800-422-6237), TTY at 1-800-332-8615. The NCI's LiveHelp service, a program available on several of the Institute's Web sites, provides Internet users with the ability to chat online with an Information Specialist. The service is available from 9:00 a.m. to 11:00 p.m. Eastern time, Monday through Friday. Information Specialists can help Internet users find information on NCI Web sites and answer questions about cancer. PubMed Health. "Adult Central Nervous System Tumors Treatment." Updated: Aug 26, 2016. WebMD shows you the foods and eating strategies that may help reduce your risk of developing cancer. Please share your experiences with adult brain or spinal cord tumors. What were your treatments of brain tumors? What type of brain or spinal cord tumor do you have, and what are/were your signs and symptoms? colicky pain, which may cause the person to writhe or roll around or pace in pain.